Season's Greetings! My apologies for my absence but I am thrilled to be back with y'all to kick off my favorite time of year. 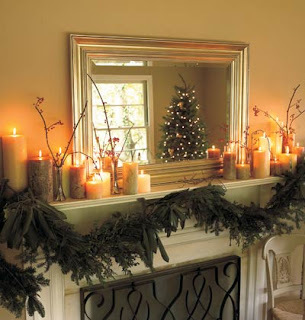 For me, this is a season filled with love, fragrant garland, giant magnolia leaves, and maybe even a bit of snow (not very likely in Georgia). 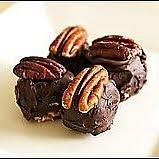 In honor of the season, I want to share with y'all one of my favorite treats- bourbon balls. These goodies are excellent to have on hand for when friends and family stop by and also make a delightful gift when packaged in a festive box. Cream butter with 1 pound of sugar; blend Bourbon with 1 pound of sugar. Combine the sugar mixtures and pecans, mixing thoroughly. Refrigerate until chilled; shape into small balls. Melt chocolate and paraffin together in the top of a small double boiler over hot, not boiling water. Working rapidly, dip balls one at a time in the chocolate; place on wax paper to dry. *Images from myideashome.com and ehow.com. This entry was posted on 7:09 AM and is filed under Bourbon Balls . You can follow any responses to this entry through the RSS 2.0 feed. You can leave a response, or trackback from your own site. Yum those Bourban Balls look so good.We are saving the recipe to try for Christmas. Thank you. I love bourbon balls! Bring on the holidays! I ADORE bourbon balls. One of the best things about this season. :-) And the mantel shown above is gorgeous! Mmmm - sound good and look good too! Drop into my tea party - we are having Vietnamese this time! Oh MY, I just love Bourbon Balls, my grandma use to make them every Christmas. I'm going to give your recipe a try...can't wait!! So glad you are back!! Being from Kentucky, where Bourbon is a staple, I am so anxious to try your recipe. I absolutely agree, Shannon! Anything with Bourbon and sugar just has to be good :). Bunny, you will have to let me know what you think of this recipe. I would never dream of making something better than Grandma as I know how very special those recipes are! That said, I hope one bite takes you back to your childhood sitting at Grandma's table for the holidays :).